Looks like Makoto’s day is about to get completely ruined. What I thought was one of the most memorable scenes of The Curious Case of Benjamin Button (2008) was when Benjamin (Brad Pitt) described a car accident that Daisy (Cate Blanchett) got into. More specifically, what I found fascinating was how Benjamin described all the little things that could have been ever so slightly different that would have kept Daisy from getting hit by a car. Tsuitsui Yatsutaka wrote an entire novel based on a very similar concept called The Girl who Leapt Through Time (時をかける少女，toki o kakeru shoujo), and the folks at Madhouse put it into animated form. It tells the story of high school student Konno Makoto, who discovers the ability to leap backwards in time after having a really bad day that almost culminates in her own demise. Things seem to be going fine as Makoto goes back and aces quizzes she would have bombed and gets herself out of bed on time. However, Makoto discovers there is such thing as too much of a good thing as her time leaping has unintended consequences. The Girl who Leapt Through Time could very easily have been yet another fantasy/science-fiction movie. Instead, it opted for a quieter approach, taking it easy on the fantastic elements and focusing much more on how Makoto’s time leaping affected Makoto herself as well as those around her. Some relationships were created while others crumbled. A boy finds himself getting bullied by the rest of his class when Makoto altered history so he was the one to cause an accident in a home economics class instead of Makoto herself. The movie, with exception, treats everything in an understated way. In an equally subtle way, The Girl who Leapt Through Time tackles philosophical issues I generally would be unlikely to expect in an animated film of this sort. People may complain that the whole concept of “With great power comes great responsibility” theme has been done to death, I think The Girl who Leapt Through Time did a good job of handling it in a fresh way. Overall, the movie was very well presented. 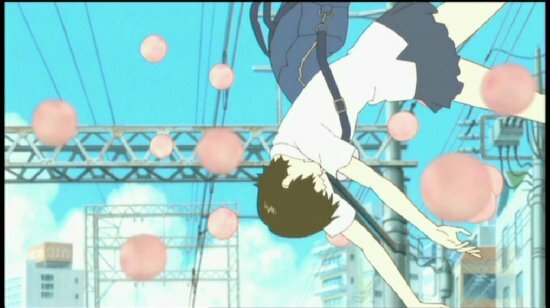 Studio Madhouse has a reputation of creating visually appealing anime, and The Girl who Leapt Through Time was no exception. While the art can seem a bit simplistic at times, everything moved beautifully. Needless to say, it’s nothing that will make a modern Ghibli film jealous, but The Girl who Leapt Through Time is still a really pretty movie. I did fall quite a bit in love with the soundtrack. Yoshida Kiyoshi’s score was, like many other parts of the movie, very subtle but fitting. Basically, it fit perfectly with the feel-good nature of the movie overall. That said, the voice-acting was a mixed bag. Naka Riisa did a good job as Makoto for the most part, but in certain instances (like when Makoto cried) Naka demonstrated she is definitely not an experienced voice actress. J-drama actress Hara Sachie did a decent job as Makoto’s aunt, but it did perplex me just a little as to why Madhouse decided to hire screen celebrities for the major roles while veteran voice actors like Tachiki Fumihiko (known for characters like Neon Genesis Evangelion’s Ikari Gendo or Hasegawa from Gintama) were relegated to supporting parts like Makoto’s teacher. Nonetheless, the voice acting was a pretty minor issue I took. Overall, The Girl who Leapt Through Time, while the opposite of the Miyazaki-type epic, is a beautiful movie in its own simple way. For that reason, I can say it was one of the best animated films I have seen. As I stated in the review, the issue I really took with Makoto was the fact that I wasn’t really a fan of her voice actress. I feel like that’s probably why you feel the way you do as well. nah, I don’t think so, Makoto wasn’t my only problem, through the whole anime i waited for something to happen, i don’t mean some action or adventure scene just something that will make an impression on me, something that would resonate with me, a feeling, a connection, i don’t know how to express it, but that just didn’t happen. somehow i wasn’t able to get sucked in the story. i can’t tell why because this is a decent anime and i can’t pinpoint flaws in saying that is the cause of my antipathy.